We are bonded sisters, our names are Kodi & Jules and we are 9 Years Old and are as sweet as can be. I’m Jules and I want to tell you a little about myself. I had some bad allergy symptoms when I got to my foster home. I am getting some medicine that is helping me. I also had ear infections, but those are getting better too. Foster mom has given me some special baths that are also helping my skin. I feel so much better. I am very quiet, sweet, motherly and have wonderful manners. I have great energy for a girl my age. I know how to play catch with a ball and will bring it back to you to keep playing. Kodi here, now it’s my turn to tell you about myself. I love to chase a ball, but I let my sister pick it up and bring it back. I love to walk around with my stuffed babies. And, just like my sister, I have a lot of energy for a senior girl. I can be sensitive and get scared of loud noises, but my sister helps me and reassurance from my foster mom also keeps me calm. We both are wonderful house guests and very easy to have around. We love to go for walks and foster mom and dad have even taken us for rides on their boat. 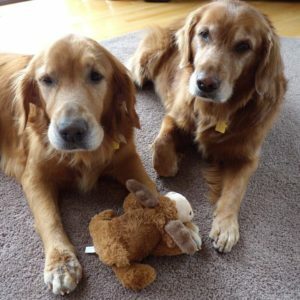 If you are looking for two wonderful senior girls, we will complete your home with double the love.